AMTECH Basket type Strainers widely used in Filter plants.Filters are fabricated as per customer requirements like 20 mesh,40 mesh, 60 mesh, 80 mesh , single filter element and double filter element. 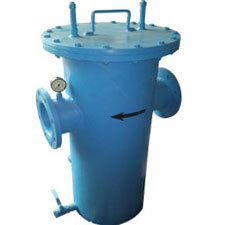 This filter has wide area of filtrations, require near pump in industry. The strainer element is very easy to replace from opening top. The pot strainer can be provided with pressure gauge to measure inlet and outlet of strainer. The life of the basket/bucket strainer is long compare to y strainer. We can manufacture sizes upto 24"